Spot on as usual, Father, and admirably clear. By the way, have you finished your series on Apostolicae curae? This is so true. An important example of the principle at work was the Patriarchal 'schism' that almost happened in the Ukrainian Catholic Church during the second half of the twentieth century. Many Ukrainians wanted Joseph Cardinal Slypyj to be named patriarch. This led to two factions within the Ukrainian Catholic Church, dividing communities, clergy, people and property. Nowhere was this division more bitter than in the UK. Pope John Paul II wisely explained that a Patriarchate must be linked to a geographical territory over which the Patriarch has jurisdiction and in which he is resident. At the time, it was not possible for such a situation to pertain in relation to the Ukraine. Within the Roman Catholic Church, Metropolitan Archbishops have much less power of governance over their suffragan sees than I imagine is the case in the Church of England. Likewise, the modern notion of Episcopal Conferences is a matter of organisation rather than jusridiction. The drop of the title Patriarch of the West (and the retaining of such titles as Vicar of Christ and Supreme Pontiff of the Universal Church) was a mistake in my view, precisely because it rendered the special relationship Latin Rite Catholics have with their Pope void - to us English Catholics he is (or was) Pope and Patriarch. To Roman Catholics he is local bishop, archbishop, metropolitan etc all at once. To the ''Uniates'' he is merely pope. Is there a Western patriarchate anymore? The first pope to adopt for himself the title of Patriarch (in this case "Patriarch of Rome") was Pope Theodore I (642-649), a Greek or at least an Easterner -- but one who struggled manfully in his pontificate against the imperial "Ecthesis" and its promotion of Monothelitism. Earlier popes may have had the title applied to them by earnest (or flattering) correspondents, but down to 642 they paid no heed to it, and for some centuries thereafter their use of it was occasional and sporadic. I wonder if it was because "The West" is not the title of a See, as are Antioch, Alexandria etc. And was the creation of (titular) Patriarchates of Venice and Lisbon a hint that the West, like the East, might one day have several Patriarchates (the Americas, the Indies?). The Orthodox have created new Patriarchates (Moscow and others) to meet new historical situations. I do not think that Rome has ceased to be a Patriarchal See, or am I wrong? First, no Orthodox that I know of claim that "intermediate primacies" are de jure divino, so to that extent you are labouring to demolish a straw man. One might plausibly argue that the idea that intermediate primacy should exist is de jure divino, but no one could argue (on Orthodox grounds, anyway) that the specific arrangement of intermediate primacies -- who holds them and what their jurisdictions are -- is of divine right. The Church has always been free to re-arrange such matters. Your more fundamental error, however, is in mischaracterizing the "universal Church." It is certainly true that St Paul speaks both of the local Church and of the universal Church; but the universal Church is not the Church Militant spread over the earth at a particular time, but the Church Militant and Triumphant, in all times and in all places, in this age and in the Eschaton. When St Paul speaks of "the fulness of him who fills all in all," he can hardly be speaking of the Church Militant only, and still less of the Church Militant at a particular time only. And the head of the universal Church, properly understood as encompassing all times and places and both this age and the age to come, is and can only be our Lord Jesus Christ. Even if all the Papal claims were true (which I deny) and the Pope's jurisdiction were universal and immediate over the whole world, he would nevertheless remain an "intermediate primate": intermediate not in space but in time. You cannot use St Paul's notion of the universal Church in defense of a universal Papal primacy, because the universality St Paul speaks of does not correspond to the scope (spatial and temporal) of the jurisdiction the Pope claims. Very valuable observations, Father! I am one of the ignorant who do fear a tyrannical monolith. I admit everything you write, but know from personal and painful experience that, although the "Papacy does make possible an institution which might be capable of protecting the weak from bullies nearer home", it actually made possible the bullying of Bugnini and his Liturgical totalitarian allies on a universal scale. This would indicate that the Divine Purpose of Roman Primacy lies elsewhere than in what you have said so far. That is no criticism of you. You have much more to tell us, I am sure. I think I am right in saying that the consistent use of the title Patriarch of the West only goes back to the early nineteenth century - possibly Gregory XVI. It is a title which does not have the continuing pedigree of Vicar of Christ or Servus servorum Dei. I think Chris Jones makes a good point about S. Paul including the church triumphant in his view of the universal church, but I would ask if it really matters. In our day when 70% (figures are total guesses) of the church is dead, is talking about just the church militant all that different from when only 2% of the church was dead when S. Paul wrote his letters? It seems that the author misunderstands the point of what the Metropolitan was saying. Kallistos wasn't claiming the lack of strong regional 'churches' possed some kind of ecclesiological gap in western theology. Its easy to see how it could come have come accross that way since he referred to the regional synods as churches. However, in my understanding, these regional 'churches' are more appropriately called synods and dont have their own special ecclesiology in the way the Local and Universal Church does. Kallistos was speaking of the need for the roman church to further develop effective regional 'churches' for administrative purposes. The regional synods are an ancient tradition which had much use in the early Church east and west. The patriarchal Churches have a certain ranking in the dyptics which ended up making their bishops the leader of the synods which formed around them. They act in a similar fashion to the first among equals in the Universal Church, yet these regional synods do not have a special ecclesiological theology related to them. Where is the "sensus fidelium" in all of this? Gone, it would seem, a result of decoupling the liturgy from the people and the eucharistic center of each local church, namely the ordinary. This fusion of local and liturgy is the bottom up, which in my view has been completely eviscerated by the second millenium trajectory of the Papacy towards hyper centralization. 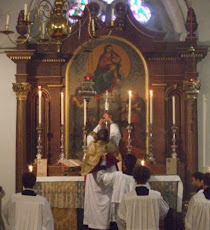 In its wake, you have no conscious memory left of attachment to "as we pray, so we believe" in the West, as evidenced by the speed with which liturgical reforms, which are foisted top-down via Papal ukase onto the Latin rite, as accepted by bishops, priests and lay made passive by a thousand years of this power play. And if you get some pastor or bishop who wants to experiment more, no problem! Who's going to stop them? So long as its done with the perceived blessing of the Papacy, you don't stand a chance. But who did Pope Paul VI take to the woodshed for saying there where limits to Papal authority to change the liturgy? Arch Lefebrve. There's the proof of the paradym.